I gained some weight and didn't like what the stores had to offer for larger females. So I took the idea of "Barbie" in here box and made it work with my weight. I then added A little story on the back to add humor to the idea of "Plus Size Barbie". Example: "The Barbie with more to love!" I found a box that could fit into and cut a rectangle out of the front of the box. I attached bungee cables to the inside/ back of the box to make it like a backpack. Next, duct taped the bungees inside the box and outside the box to ensure that they wouldn't come out while I was walking around. After that, I glued down a piece of poster board on the back to cover the bungee cords. That way they weren't showing through on the back of the costume. I then painted the box pink. Finally, I printed Barbie logos and glued them all over the box. I also photoshoped some Barbie products on the side of the box and listed them as "Coming soon". They were unusual ideas that Barbie may never actually have. 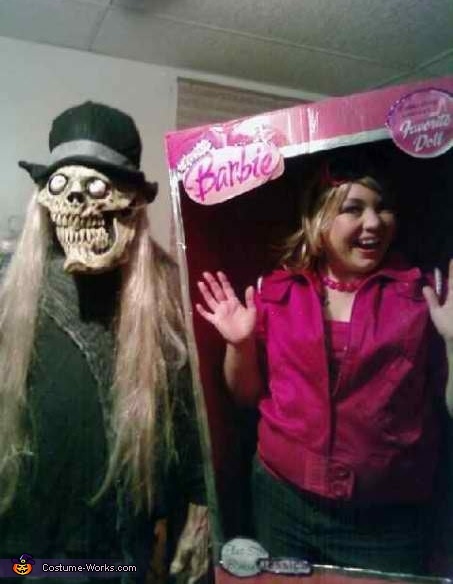 Example: Barbie M16 and Gothic Barbie.